Drought is normal for Southern California, but many of our public and commercial spaces are landscaped with water-thirsty plants. 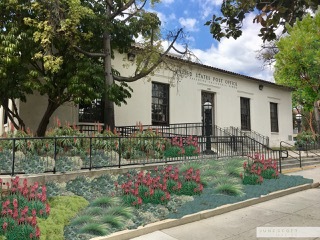 To help create more climate resilient landscapes, South Pasadena Beautiful is launching an initiative to create a new sustainable low-water garden at the South Pasadena Post Office. The project will unfold in two phases, dying trees and grass in front of the building will be replaced with disease-resistant shade trees and colorful, California-friendly planting. The second phase will renovate the large lawn area to the side of the building with a new seating area and low-water plants and trees selected for their ability to attract birds and butterflies. SPB is seeking to raise $35,000 for this project. Monetary donations from the community and volunteering on special planting days will help us realize this project together, for the benefit of the city. New landscaped as imaged here. Plants selected for the landscaping project!